Admittedly winter is almost upon us according to the calendar, but we still have a couple weeks of autumn left and I’ve been working hard this past week to finish the Autumn 2014 issue of Tales of the Talisman Magazine. The issue has something of a mad science vibe with stories of elder gods manipulating the Large Hadron Collider to break through to our world and Thomas Edison working to contact the dead. We also meet nineteenth century scientists working on the first artificial heart and we see a world where the wealthy reenact early space flights. There are plenty of other stories as well, including the tale of a man who seeks King Arthur’s grave to implore the once and future monarch to rise and save the world. A doctor visits a village in Mongolia only to encounter terrifying magic. Another man peels up the corner of the world to reveal the elephants underneath. Of course, the issue itself is supported and enhanced by wonderful speculative poetry and terrific illustrations. I hope to send the issue to press sometime in the week of December 14. My guess is we’ll be shipping it out early in 2015. 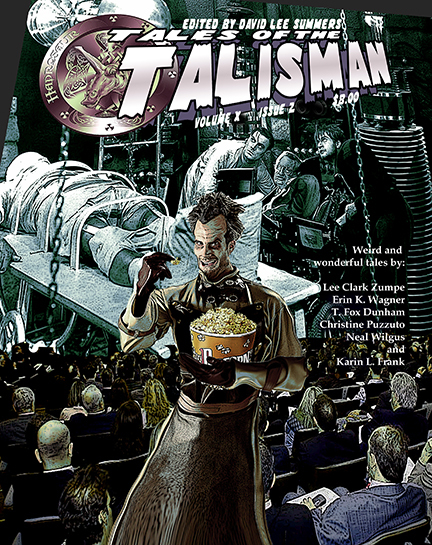 Please watch for it to appear at TalesOfTheTalisman.com and support the fine work of the authors and artists who have made this issue possible. I suspect most people have heard by now that Tales of the Talisman will be going on indefinite hiatus. I thought I would take this opportunity answer some questions I’ve received about our break from the magazine. Why are you going on hiatus? In short, both Art Director Laura Givens and I have a lot of new, exciting opportunities on our plates and we could use more time to focus on them. I am contracted to deliver two novels to Sky Warrior Publishing in the next eighteen months. I will start working with my editor on a third novel for Lachesis Publishing early in 2015 and I have several other projects both personal and professional that have long been on the back burner simply due to lack of time. By my estimate, I spend about 4.5 months of my year working at Kitt Peak. This is pretty much on par with an ordinary eight-hour per day, five-day per week job. Tales of the Talisman requires about 4 months of my year. That leaves about 3.5 months to do everything else, which has included writing a novel roughly every other year, multiple short stories, and attending conventions to promote my work. In 1995, I assembled a small anthology called Hadrosaur Tales. That soon grew into a magazine, which I edited until 2005. At that point, in consultation with several people, we decided to take the magazine to the next level and add illustrations and give the stories the presentation they deserve. This became Tales of the Talisman. When will Tales of the Talisman come back? The most straightforward answer is, I don’t know. In short, deadlines are upon me for some of the projects I’ve mentioned above, plus I’m still spending time working on getting the final issues of Tales to press. I simply haven’t had time to consider that question. I plan to have a more definitive answer by the end of 2015. Will Tales of the Talisman come back? I’m not entirely certain, at least as it exists in its present form. Hadrosaur Productions, the company that publishes Tales of the Talisman remains committed to presenting great short speculative fiction. What we have to consider is whether the magazine is the best, most cost and time-effective way to do that. I have been considering other options, including an annual or semi-annual anthology, which might allow for quicker ebook conversion and easier distribution. How long will Tales of the Talisman be published? We have purchased stories through the spring 2015 issue. So, including the one that’s about to go to press, we have three issues to go. The artists are currently working on the winter issue, so I hope it will be released well before the spring winds start blowing here in New Mexico. We have all the material we need to fill those issues, so there will be no further reading periods until such time as we start up again, in whatever form that happens. How will subscriptions be handled that extend past the last issue? We don’t have many of those at this point. If you are one of those subscribers, I’ll contact you after we ship the final issue and find out if you want a refund for the balance of your subscription or if you’d like a product from the Hadrosaur Productions catalog for the value of the subscription. If you have a question that I haven’t covered, feel free to ask in the comments. I want to thank all those people who have supported Tales of the Talisman and Hadrosaur Tales over the years. I ask that you continue to support my work and growth as a writer in the coming months. I hope that growing as a writer will help me grow as an editor as well. When we come back—in whatever form that is—I want the short fiction and poetry venue of Hadrosaur Productions to be a strong, vibrant home for the best voices in speculative fiction. My goal for this hiatus is to grow so that the material I choose and guide remains on that cutting edge. Please visit davidleesummers.com, browse my books and sign up for my newsletter.